Lanterns: The Harvest Festival was one of my favorite 2015 releases. It combines the set-collection of Splendor and Ticket to Ride with the tile-matching elements of games like Carcassonne and Cacao. But I definitely like this game more than Splendor, which was one of the biggest hits in 2014. For the most part, it would appear that Lanterns has gone under the radar until TableTop played it on their first Season 4 episode. The three sets of devotion tokens that act as points for the end of the game. There are three "wilds" that give 4 points if any stack runs out. Also pictured: first player marker (a boat) and some favor tokens. 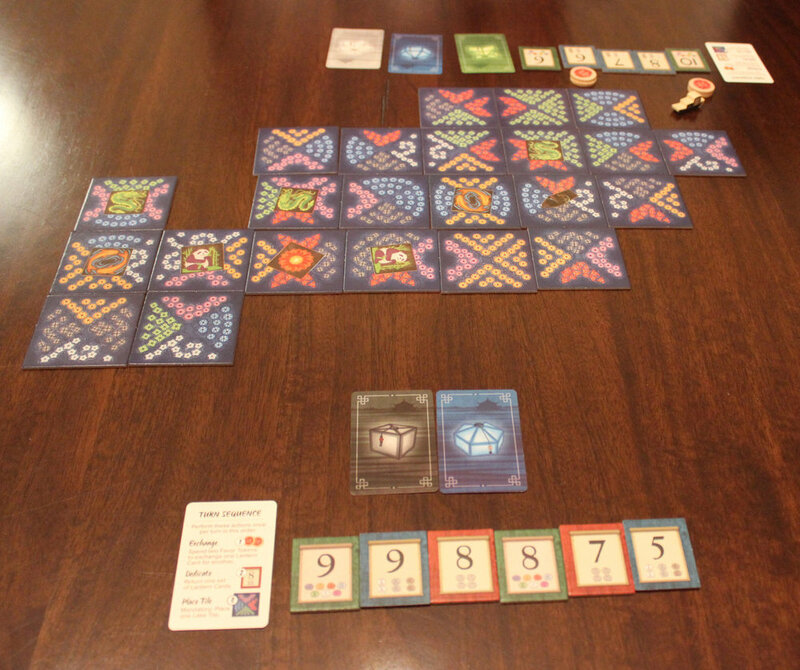 Lanterns is a very simple game and very easy to pick up on. Each turn a player places one of their lake tiles adjacent to any other tile already on the board. Each lake tile has four different sections representing lanterns floating on the water, each quadrant with its own particular color. Whatever color is facing the players around the table, that's the color of the lantern card they'll collect. For example: if I wanted a red lantern card, I'll play a card that has red in one of the quadrants and ensure that it is facing me. So theoretically, every turn a player should be receiving a lantern card (unless the pile runs out). The active player can also receive bonus cards by matching any side of their tile to a matching color of another tile. Now that you've been placing these lake tiles and collecting lantern cards, what do you do with them? You cash them in for "devotion tokens," which is to say, points. There are three sets of devotion tokens, each with their own requirement: 1) one of all seven lantern colors, 2) three sets of pairs, and 3) four of a kind. As players collect these tokens, the tile below it loses value, so there's a bit of a race for the first couple of scores for collecting them go down, so there's a little bit of a race to get the tokens before the other players. So in essence, you place tiles, collect cards, and cash cards in for points. Easy, right? There's also the chance to gain "favor tokens," little round chips that can be cashed in as pairs at the start of your turn. Doing this allows you to exchange one of your lantern cards for another one of a different color, giving you the opportunity to mix and match what lantern cards you need for more points. Here, the player across the table has placed a lake tile with the fish platform next to the tile with the panda platform. That player gets a blue card (because the blue faces her) and a white (because she matched a white side with a white side). She also gets two favor tokens for matching two platforms. Meanwhile, the second player across the table gets an orange card (because the orange faces him). Once the lake tile pile has run out, play continues until all tiles are placed, and then one final round is done to let people cash out their final lantern cards. Highest points wins! What I love most about this game is how peaceful and beautiful it is. The tapestry of lake tiles placed as the game progresses is fun to watch grow and expand in all directions. The game is meditative, almost zen-like in its play style. Sure, you can get really in depth with strategy, and optimizing each play for the most lanterns or the colors you need while depriving your opponents will lead to a steady victory, but most of the time players are too focused on placing tiles as they see fit, adding to the mosaic and retrieving their lantern cards in a very calm, enjoyable mood. Besides, you never know what tiles the other players will place, which means your strategy could change by the time your turn comes around. I don't think this game works as a cut-throat game, and its ease of play makes this an excellent gateway game. It works well as a palette cleanser when you want to de-stress from heavier titles. I haven't noticed much difference in how the game plays with different player counts, having tried the 2-, 3-, and 4-person games. 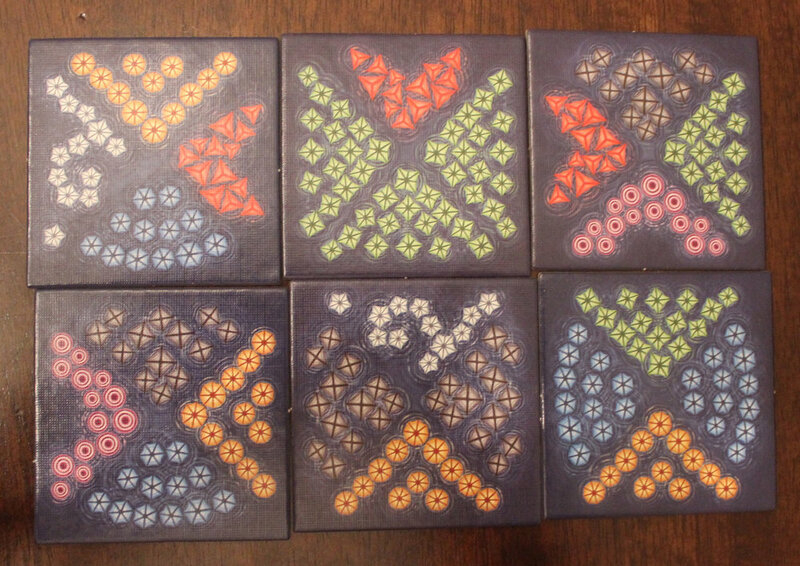 Lanterns works well with each, as the number of tiles, devotion tokens, and lanterns are adjusted for every player count. I highly recommend this game to anyone who wants something fun and simple, with enough strategy to keep you interested but not so much as to overwhelm you. I think this will appeal to people who enjoy games like Splendor and Cacao, but if you've never played or even heard of those two games, I still think this is an excellent choice. Finally, there is an expansion coming out in early January called Lanterns: The Emperor's Gifts that adds some variety to the game, but I won't know much about it until I play it next year. In the meantime, Lanterns: The Harvest Festival is an excellent game, and I recommend it for veterans, newbies, and family gamers alike.